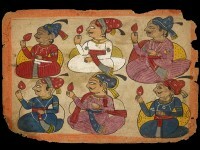 Composed by the court poet Keshav Das in 1591, the Rasikapriya is a Hindi poetical treatise on the classification of idealised types of male and female lovers (nayakas and nayikas) and their emotions and interactions. The princely nayaka figure is often shown blue-skinned like the amorous god Krishna. Here the sakhi, the companion and confidante of the nayika, acts as a go-between and brings the wayward nayaka before his lady’s chamber. She evidently tells him of the nayika’s suffering in separation from him and her pain at his infidelities. The wrathful nayika sits brooding within her palace chamber. 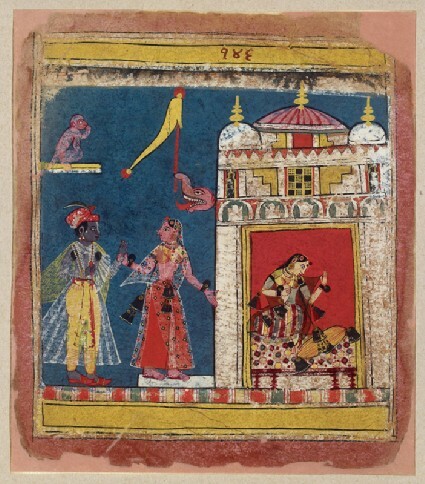 As in other pages from this series, a flag-bearing makara (crocodile) finial, emblematic of the love-god Kama, projects from the palace wall, and a monkey looks on from a ledge above.